In this volume, nearly forty internationally recognized researchers have come together to celebrate the work of the famous Anatolianist and Indo-Europeanist H. Craig Melchert. 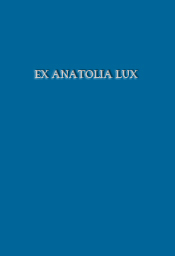 The topics range widely, covering not only the grammar and lexicon of Anatolian languages but also Tocharian, Latin, Phrygian, and many others. Some of the essays represent major new contributions to the field that no specialist can afford to overlook. Both long-established scholars such as J. David Hawkins, Anna Morpurgo Davies, Harry A. Hoffner, Jr., Jay Jasanoff, Norbert Oettinger, Calvert Watkins, and the late Roberto Gusmani, as well as younger scholars such as Alexandra Daues, Petra Goedegebuure, Alwin Kloekhorst, Ronald Kim, and Jeremy Rau have contributed the fruits of cutting-edge research in Melchert's honor. A complete bibliography of Melchert's works is included, and the volume closes with a word-index. One color plate presents a previously unpublished Hieroglyphic Luvian inscription. Click here to see a full list of the contributions.